Winnie E. Hix, 92, of Searcy passed away Saturday, February 9th at Unity Health Medical Center. She was born December 19, 1926 in Batesville, Arkansas to the late James and Elizabeth (Johnson) Kimbrough. Winnie met the love of her life Willard R. Hix in Batesville, Arkansas. They married in 1942. She was a homemaker, who raised two children as well as having a close relationship with her beloved niece, Dolly. She enjoyed crafts, cooking, and baking cakes. Some of her most enjoyable years were traveling with Willard for his work and she often spoke of the adventures that they had together. From her birth until her death, Winnie was known for her infectious laughter, her kind words spoken about everyone she knew, and her gentle spirit. She loved everyone she ever met. Winnie was a member of the Church of Christ denomination and attended Antioch Church of Christ in Batesville much of her adult life. 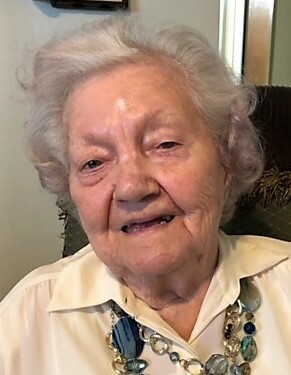 Left to cherish her memory is her daughter, Shirley Duprel, husband, David of Greenville, Mississippi; five grandchildren, Tammy Goodwin, Teresa Cobb, Nicole Ventura, Beth Lewis, and Brian Hix; five great grandchildren, four great-great grandchildren; and lifelong friend, Mary Jane Homan; and loving neighbors, Dois Hulsey family and especially her little helper, Mandy Elbert.